Aqua Essentials are expanding all the time and expanding our plant range is top of our agenda. Three NEW varieties from the Eloquent Echinodorus family have just landed on the door step and are ready to go! Firstly, I would like to introduce to an Eloquent Echinodorus which is the Echinodorus spectre. 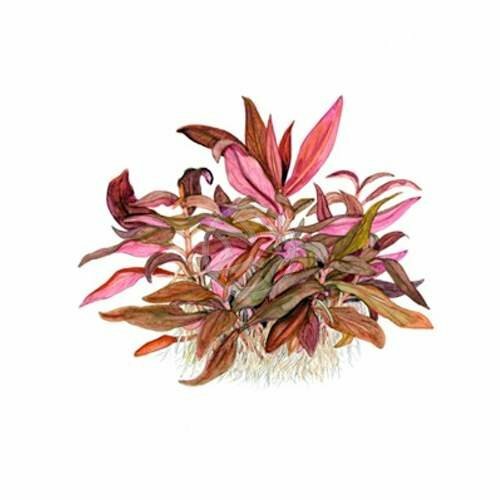 A classic background plant that is stong and sturdy and will add immediate impact to your aquascape. 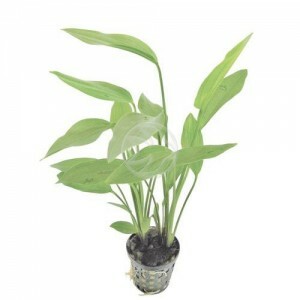 Echinodorus spectre have large long leaves so will need plenty of space and light inorder to flourish in your aquarium. When planting Echinodorus spectre up they must not be over-shadowed by larger leaved plants. These really are perfect for beginners due to the easiness of keeping. Secondly, we also have new in to us and to add to our Eloquent Echinodorus family is Echinodorus gabrielii which is a foreground plant ideal for more skilled hobbist’s. This Echinodorus is quite unusual in comparison to all the other Echinodorus due to it’s size. A tidy looking compact plant that is very pleasing on the eye. And finally another Echinodorus to add to our range of Eloquent Echinodorus is Echinodorus parviflorus which is another easy to grow plant. It is most suited to large aquariums due to the fact that it can grow up to 70cm if given plenty of space. Perfectly suited to the background of the aquarium, this Echinodorus looks amazing when planted in bunches. Three new Eloquent Echinodorus additions to our range which is very exciting and more to come so watch this space! Any questions or advice please give us a call on 01363 774787 and we will be happy to help. 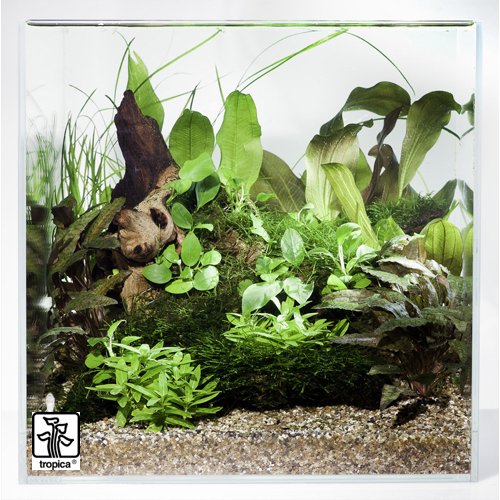 We just thought we would introduce you to our new Scaped For You Collections that we have just started offering here at Aqua Essentials. What are Scaped for You Collections? Scaped For You Collections are essentially ‘ready made’ aquascapes if want of a better phrase. They are aquascapes that have been created by professional Tropica Aquascapers and come with guidelines explaining how to replicate the scape in your own aquarium. Some people admire scapes they see on Facebook, pinterest, Twitter etc done by the likes of George Farmer & Dan Crawford who are very talented Aquascapers and so many more out there. They think to themselves “Oh I wish I could have that in my aquarium but just do not have the time to research all the plants needed nor spend time aquascaping it”. Well this is why we are offering you these Scaped For You Collections compliments of Tropica. So what do I get? We are offering a variety of Scaped For You Collections for different sized aquariums. We send you all the plants, wood and rocks you will need to produce your chosen aquascape. You can refer to the product page on our website for easy to follow instructions which guide you when planting, positioning your rock and wood. You can also view the You Tube video by Tropica which explains step by step and guides you along the way. We even tell you which gravel or sand to use too. So go to the product page (highlighted links) and choose the right Scaped for You Collection and then just ‘buy’! All that you will need will be packaged up and sent to you. As you are no doubt aware we hold a large quantity of plants in stock so it is very rare that we will not have the plants in stock that you order. However there may be occasions where a particular plant is not in stock or out of season or we are short of quantities (some Scaped For You Collections do require a large quantity of a certain plant) so we will have to order it in hence the reason why we give 1-7 days depending on availability however these Scaped For You Collections are well worth the wait…trust me! We have our plant deliveries in every thursday and friday and will always email you informing you of any minor delays too. What level is it for? 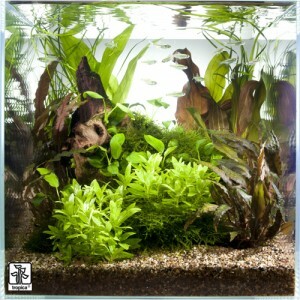 We offer Easy, Medium and Advanced Scaped For You Collections here at Aqua Essentials. Some people might like to start with Easy and progress up the ranks once they have gain knowledge and confidence and some keen and experienced Aquascapers might go straight for Advanced. You choose what suits you. Easy set ups contain plants that are pretty hardy, need low lighting conditions and non CO2 so need little maintainance and easy to keep. Medium and Advanced set ups require more attention and some will require CO2 and good lighting. What if my aquarium is bigger than the one I have chosen? That’s no problem at all! 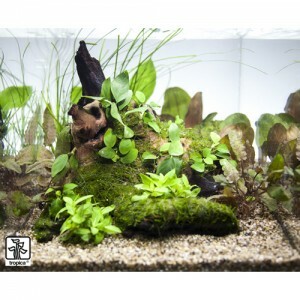 Just either add the Scaped For You Collection you would like to your basket and then just add additional plants to make it up for your sized aquarium or just email us or call and tell us which scape you are looking to order and we will advice you how many more of each plant, wood or rock you will need for your size. We are here for all the help and guidance you need so only a phone away or call 01363 774787 or email info@aquaessentials.co.uk. This is a typical Scaped For You Collection we offer which is the finished article. 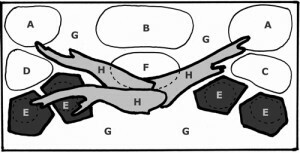 This is the type of diagram you will be able to refer to when scaping your chosen Collection. Along with the Scaped For You Collection you can refer to additional images which will show you the progress and growth expected over time. More Scaped For You Collections will be available in due course. 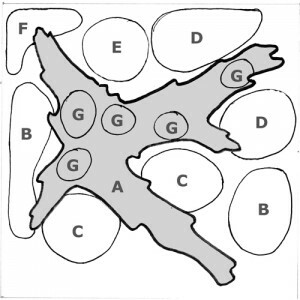 Some of you may have heard of this and some of you may have not and its called ‘The Golden Ratio’ which is widely used in planning the layout and perspective of an aquascape. We have put together a simple ‘Aquascaping Layout & The Golden Ratio’ guide on how to create a scape that is pleasing on the eye and has the right composition and design in mind. Firstly we will look at the The Golden Ratio which will guide you in creating perspective in your aquarium. This ‘Aquascaping Layout & The Golden Ratio’ guide is used when wanting to acheive the perfect balance when placing objects in a space. So let’s begin and these 3 steps explain what the Golden Ratio is. 1. Stand back and look at the front of your tank. Imagine there are four lines going across the front of the glass, two vertical and two horizontal, giving you now nine sections. 2. Where the lines cross are the Golden points where you should consider placing your key features to the tank i.e. rock, wood or prominant plants such as reds or plants that stand out. 3. 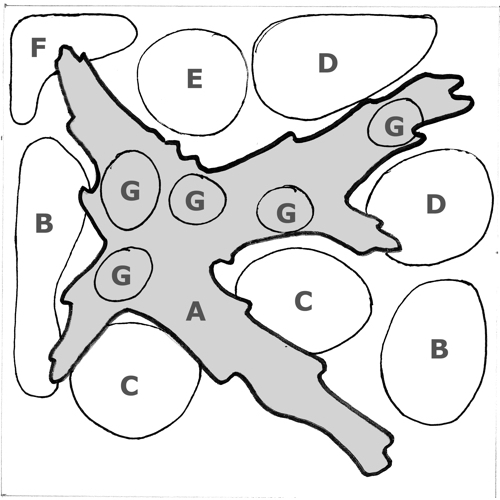 You can use the Golden Ratio to plan the height layout of your plants too. Basically symmetry does not work in a planted aquarium. It is too formal, structured and unnatural. Think about it would you see symmetry in the wild? No, so lets not make it neat and symetrical in the aquarium. The focal point (as we mentioned earlier your key feature so wood, rock, red plant etc) should be slightly off to the center. 1 : 1.62 was calculated long ago as the point which is the most pleasing on the eye. This is where you could consider having a slope on one side too, like a riverbed. Please don’t have all your ‘tall’ plants lined up along the back and try and create a ‘hedge’ or ‘wall’ of plants to cover up the background! It is not needed and only looks dated. Try replicating a mountain look by trimming your plants to be taller on the sides and slightly shorter in the center. You could also add some rocks either side (not symetrical remember to add to your mountain look). Depending on the scape you are looking to achieve, I like to keep my rocks or wood positioned amongst the midground plants as the stems can easily be hidden amongst the rocks plus you can carpet foreground plants around the base of the rocks to create a really natural look. Creating depth is not the easiest task however keeping the golden ration in mind it can be done. The first thing to remember is to avoid positioning the rocks from left to right across the middle in a straight line which just looks two-dimentional and very unnatural looking. So I recommend planting and positioning in layers starting from the front to the back leaving a small gap in between and from low to high. With time and experience you will become more bold and challenging with your aquascaping and start creating some amazing looking scapes. Another element to consider when planting your scape is to take note of the estimated growth guides that come with the plants or you can use the guide we use on our plant product page. Obviously you dont want to have to be trimming your plant all the time as it grows quicker than the one behind it so it really plays off to carefully plan your scape and even put pencil to paper first and sketch it out. 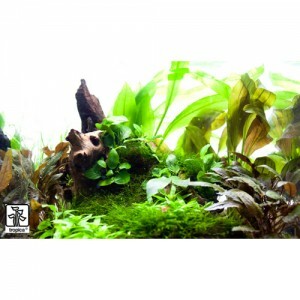 With all the above considered when putting a scape together, you should be impressed with the results. If however you need further advice we are only a phone call away on 01363 774787. Is this the best aquarium substrate in the world? It was only a matter of time before Tropica created a substrate that is PERFECT for growing plants. Let’s face it, there’s no other company in the world that I would trust more than Tropica to create a product that grows plants better than anyone else. I mean, you only have to look at their plants to know about their attention to detail and quality. Others might come close but they are the leaders. 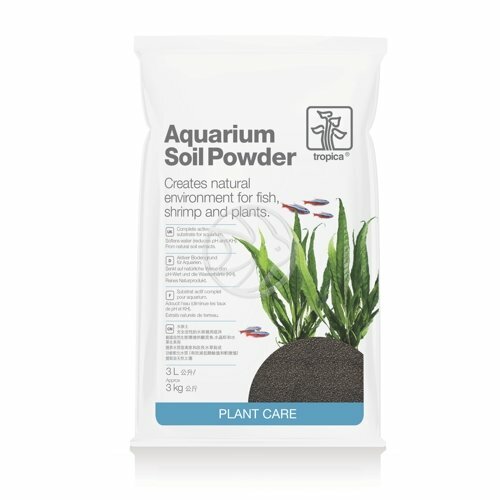 So let me introduce to you the new Tropica Aquarium Soil in both normal and powder grain size. This substrate is designed to be used on its own, no topping is required and nothing needs to go underneath it. Simply place on the bottom of your tank, and then plant directly into it, then fill with water. Easy as A,B,C. The two types refer to the different grain sizes. Normal is 2-3mm in diameter and powder is a touch smaller at 1-2mm. So why have two sizes? Well normal is ideal for bigger tanks, and by bigger I mean 100L and up. If you have a smaller tank then choose powder as it looks better with the smaller grain size. In addition to that (and what I like to do) is if you have a 100L tank, use the normal type as your substrate and then use a smaller powder bag (available in 3L) and pour it around the bottom of your wood and rocks. This gives a really lovely transition and is very subtle. And one more thing. The powder type is more suitable for smaller foreground plants as the grain size is better at anchoring them down and stops them from floating to the surface. In terms of how much you need, 1 x 9L bag is suitable for 60L of water. So all in all, I’m very excited about this substrate and know why even though it’s new in to us has already sold well. Most people love a bit of convenience right? I mean look at how popular supermarkets are. Convenience and cheap (nice combo). Outside of supermarkets that lovely combination isn’t so common. But today, I’d like to show you a CO2 diffuser that is. 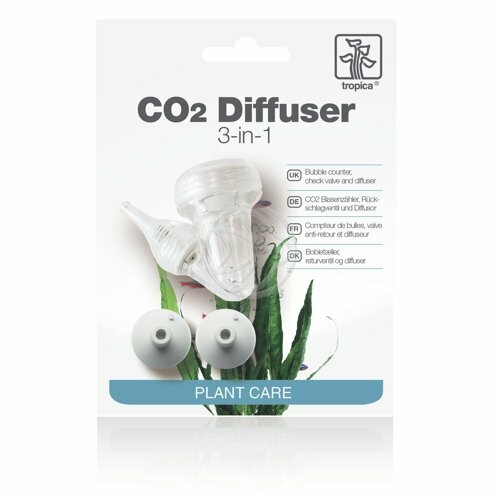 Tropica 3 in 1 Diffuser. Not only is this one of the better CO2 diffusers I have ever used in regard to creating a fine mist of bubbles, it also includes a bubble counter and non-return value within the diffuser. This means you have only one piece of tubing from the CO2 supply to the diffuser. With regard to the fine mist this took about 2-3 days to settle down and since I have not seen any further large bubbles. Tropica are incredible at what they do – there’s no two ways about it their plants are certainly the finest in the world. They’re a joy to look at and also a joy to ship out to customers like you. Their website is ever expanding too which is great – initially they only ever published information about their plants but now as a result of freelance help they have articles covering all aspects and one that caught my eye today was their article on algae which is a major issue for a lot of hobbyists. You can read their article here and they make a very good point about algae eaters so take note there. Which aquarium plants travel well? Darn good question that and one I was asked today by an overseas customer. The answer is really simple too. Avoid potted plants wherever possible. Why? 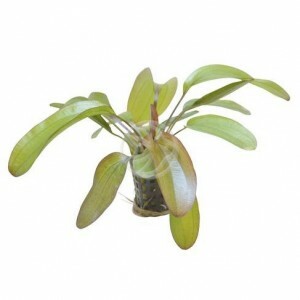 So the plants that I recommend for overseas shipping are Tropica 1-2-Grow! Not only are the light in weight so they’re cheaper to send, but they also survive for much longer periods in a box. And yes, they were fine for 3 weeks in a box (it was nice and cool though). Not only that but because of the vitro jelly, it also means they have nutrients to keep them going when traveling (unlike potted plants). See the range of Tropica 1-2-Grow! plants by clicking here. 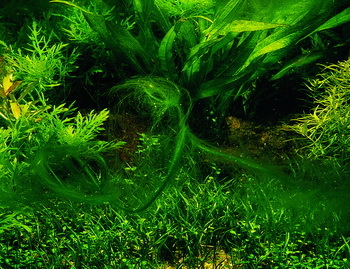 Tropica Premium and Specialised Fertilisers – which one for my tank? With the launch of Tropica’s new range of products, I felt this would be a great time to introduce their fertilisers which I might add have always been of excellent quality. Using Tropica does not guarantee you results but it’s certainly a positive step in the right direction. This recipe is based on aquariums that have a reasonable amount of fish relative to the number of plants. The liquid is orange and you need 5ml per 50L of water every week. 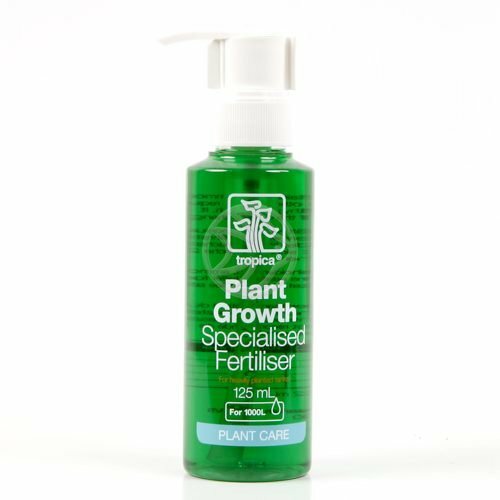 This fertiliser (coloured green) ensures it provides macronutrients, nitrogen and phosphorus into your tank which are key nutrients plants need and a high tech set up. Remember high tech = pressurised CO2 being used. Use at 5ml per 50L on a weekly basis but this is only a guide so you will need to tweak your dosage to suit. Tropica 1-2-Grow! plants. Have you tried them?! We’re delighted to announce that we are stocking the Tropica 1-2-Grow! plants and they’re looking awesome. The plants really are perfection in the making. And they may look small but don’t be deceived, because the sheer number of plants in them in staggering. Each container is jam packed full of incredibly healthy plants, just waiting to be chopped into smaller pieces by you and planted into your aquarium. For those that don’t know, 1-2-Grow! plants are grown in labs in tissue culture. That means there is never any chance of algae, snails or pesticides of any sort – it’s simply impossible. Perfect for sensitive fish or shrimp. You can find our range of Tropica 1-2-Grow! 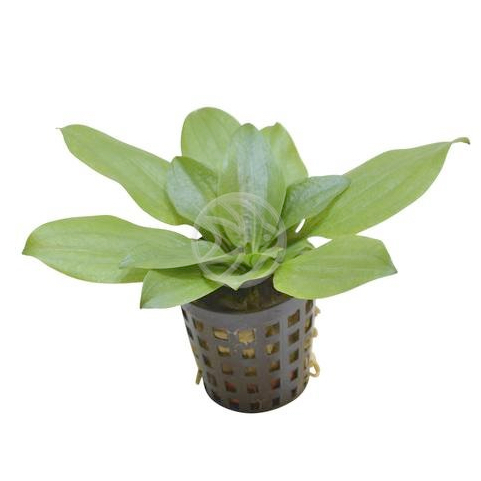 plants on our website by clicking here. As you will be able to tell it’s quite diverse already from mosses to stem plants. And because they are grown by Tropica, you know the quality and consistency is always 100%. It’s a really brave move by Tropica to introduce these sort of plants on a commercial scale. I know they feel it is the future of aquatic plants, but the question is do you? Have you tried these plants yet? Do you think they are good value? Perhaps there might be a reason why you don’t want to try them and I’d love to hear why!! Reply below! Our good friend Mark Evans has created yet another inspiring aquascape and a beautifully presented video as well. I love watching clips like this, especially first thing in the morning as it sets the tone of the day immediately. Mark is a hard worker. He tries a lot, experiments and this is proof of the hard work that he has put in and his dedication to the hobby. He’s doing wonders for the UK market and I hope it inspires you. If it does, tell me what you think!